The newest-version EFI Midmarket Print Suite, an easy-to-navigate and user-friendly browser based MIS/ERP workflow for end-to-end signage and graphics production printing management. EFI, which is in booth 301 at SGIA Expo, is highlighting advanced products that help customers drive growth in high-quality applications. One such customer, retail graphics manufacturer PVS In-Store Graphics, is boosting its capabilities as one of the first users of the EFI VUTEk h series – the next-generation hybrid VUTEk LED printer platform making its North American debut at the SGIA Expo. The company runs several VUTEk printers and chose the 126-inch (3.2-meter) VUTEk h3 printer to further its competitive advantage as a provider of high-end graphics to some of the largest brands in the world. The new EFI Pro 32r launching at SGIA Expo in the Nazdar SourceOne booth is an economical, production-level roll-to-roll printer that can make users more competitive and profitable. Designed for high-quality print with mid-level production, the Pro 32r prints up to 2,227 square feet (207 square meters) per hour, and features a built-in EFI Fiery digital front end (DFE) with FAST RIP acceleration technology. The printer, which is available from EFI, Nazdar and other authorized channel partners, uses four colors plus optional white ink and 7-picoliter EFI UltraDrop™ Technology for high-end imaging. Its proven, “cool cure” LED imaging technology drives down operating costs with less energy use and waste while delivering superior results on an extended range of supported substrates. A host of value-added options are available as well, including slitters,automatic blockout printing, manual backlit printing, an iPhone® printer management application and a software productivity pack featuring enhanced tools to reduce media waste. The 138-inch (3.5meter) wide EFI VUTEk 3r+ roll-to-roll printer launching at the SGIA Expo builds on the success of the nearly 150 global VUTEk 3r and 5r roll-to-roll LED printer installations in less than two years. The “plus” platform, which also includes the 204-inch wide VUTEk 5r+ model, drives greater value for signage and graphics professionals in high-volume, premium-quality close viewing applications. The 3r+ and 5r+ models deliver high-end imaging with superior ink coverage, high color density and a wide color gamut. Users also gain improved white printing with up to 30% faster throughput compared to the original VUTEk 3r/5r models. An improved platform chassis for the printers delivers highly accurate feeding and reliability while allowing for an exceptionally wide range of media types. Plus, several new options are available, including double-bladed slitters,multi-roll support for automated backlit and blockout printing, and upgraded ID backprinting using white ink for dark-colored substrates. Designed to offer the lowest total cost of ownership, the highest image quality, the highest rated throughput speeds and the most available options in their class, the two new VUTEk roll-to-roll printers print with EFI - 3M™ SuperRange inks, including white ink, covered by the 3M™ MCS™ Warranty, or with EFI - 3M™ SuperFlex inks for vehicle wraps and fleet graphics. The EFI VUTEk h series making its North American debut is a 126-inch wide printer series platform built from the ground up to offer higher productivity, print quality, reliability, capability and profits. It is the culmination of EFI’s decades of experience in signage and graphics production technologies as the world’s leading manufacturer and developer of UV and LED inkjet superwide-format printers and inks. The series’ new, high-velocity 7-picoliter UltraDrop Technology grayscale printhead imaging delivers precision dot placement and consistency. The series offers eight- and optional four-color printing modes plus white, as well as nine-layer print capability in a single pass. 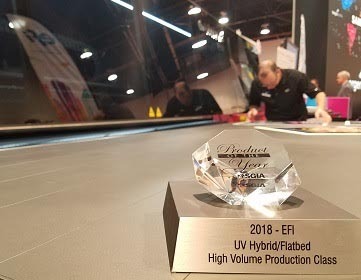 The new VUTEk h3 model on display – SGIA’s 2018 Product of The Year award winner in the UV Hybrid/Flatbed High Volume Production Class category – offers maximum throughput of up to 74 boards per hour. The h5 model, which is available direct from EFI or asfield upgrade to the h3 model, can produce up to 109 boards per hour. Ricoh® USA, an EFI channel partner, is featuring two printers from EFI’s Wide Format inkjet printer portfolio in its booth, No. 3601: the 65-inch wide EFI Pro 16h LED hybrid printer (which also is in the EFI booth), and the EFI Pro 24f, a LED flatbed printer with true 4x8-foot architecture. Both printers feature high-quality versatile white ink and variable-drop grayscale imaging, as well as built-in EFI Fiery proServer Core DFEs with FAST RIP acceleration technology for speedy file processing, higher throughput and accurate color management. The 71-inch wide Reggiani FLEXY printer is running at SGIA Expo as part of the new Reggiani TERRA system for direct-to-textile production. EFI Reggiani TERRA eliminates the need for steaming or washing on direct-to-textile applications using a greener, more-efficient polymerization process that takes place as printed textile goes through the printer’s on-board dryer. Users can achieve superior results – including excellent wet and dry fastness, intense colors and fine detail reproduction – while using less time, water and energy. New software developed for the TERRA system speeds productivity and improves print management with real-time image processing and advanced ink usage and throughput monitoring. Industrial textile producers and apparel designers can drive even greater efficiency by using EFI Optitex’s cutting-edge 2D and 3D CAD software. The new software version, O/18, is making its worldwide debut at the show and delivers a faster, more customizable, user-friendly experience, saving time and resources with a faster time to market. This new launch includes a variety of 3D innovations, including an all-in-one avatar feature that allows users to easily create sizes, define poses and otherwise customize avatars with either a scanned avatar or one from the Optitex library. The software’s innovative features support multiple dynamic avatar poses, improving the process for users to easily and accurately review final draped results and test fit and pattern placement. The software also provides more than 100 types of pre-defined fabrics to choose from. Users can now visualize their designs before creating physical samples in a better, more realistic digital environment that features an accurate final draped result. In addition, a new EFI Optitex Marker Creation Wizard simplifies the production process as it enables users to create and define multiple markers within a single, user-friendly interface. Another featured product, EFI’s Fiery DesignPro software suite, is a series of plug-in applications for Adobe® Illustrator® and Adobe Photoshop® that gives design teams the power to quickly and easily create professional textile or apparel designs. It is shown at the SGIA Expo along with the Fiery proServer DFE, which delivers professional color management and high-quality RIP output for EFI Reggiani digital printers. The new version 4 of EFI’s Fiery DesignPro software suite includes new and updated plug-ins that significantly reduce the time and effort needed to create repeat patterns and sophisticated colorways directly within Photoshop. The new tools now also offer multi-channel separations with more color depth, eliminating the need to reduce designs to indexed colors. Users also gain superior fidelity with smoother transitions and gradients and optimum color results, especially for digitally printed textiles. Exclusive bi-directional integration between Fiery DesignPro and Fiery DFEs for textile applications provides a seamless handshake between design and production. All production and sampling print queues are at designers’ fingertips, allowing direct submission of print-ready data from Illustrator or Photoshop to the Fiery DFE without flattening, exporting or cumbersome hot folder management. Additional technologies in EFI’s SGIA Expo exhibit include the latest version of the EFI Midmarket Print Suite, a comprehensive workflow featuring Pace™ ERP software. The Suite features an interface for display graphics users that addresses the unique needs of this segment for faster estimating and job production. MarketDirect, EFI’s advanced multi-channel customer communication platform software is featured at the show as well, as is EFI Digital StoreFront® eCommerce software. Attendees also can witness immersive VR demonstrations of the high-volume EFI VUTEk HS125 Pro hybrid printer and the EFI Nozomi C18000 ultra-high-speed corrugated packaging press – winner of the SGIA 2018 Product of the Year award for single-pass print technology. For more information on EFI’s advanced technologies for digital printing, visit www.efi.com. The EFI VUTEk h3 printer, winner of an SGIA Product of the Year Award, made its North American debut at the SGIA Expo.